The following medical and safety notes have been prepared by Lorne Pier to Pub medical expert Dr Kevin Moriarty. The notes are based on experience gained through conducting the swim since 1981. They are a must read for all competitors. The main risks confronting participants are Hypothermia and Exhaustion Due to the high rate of hypothermia in junior age groups all entrants under the age of 14 should wear a wetsuit. All other competitors should give serious consideration to wearing a wetsuit to avoid hypothermia and increase their enjoyment of the event. Swimmers should bear in mind that most training is done in still water heated pools. Pool water is 10 C degrees warmer than the ocean and is not exposed. Do not underestimate the impact of these conditions. It is very important to keep warm before the swim and dry off and cover up quickly after the swim. Clothes transport from the pier to post swim change tents is provided by the Lorne Surf Life Saving Club to help you stay warm and dry. Avoid heavy alcohol intake the night before the swim, as alcohol dilates blood vessels and accelerates heat loss. Your chance of getting hypothermia greatly increases if you overindulge in alcohol. Anxiety or ‘butterflies in the tummy’ can cause people to miss meals the night before and/or breakfast that morning. You must eat. You need the calories both for energy and warmth. A high carbohydrate meal the night before and breakfast on the day of the race will go a long way in avoiding problems of exhaustion and hypothermia. If you are on regular medications continue to take them and include a list of them with your entry form. Do not swim if you have flu or a viral illness in the ten days preceding the swim. Such illnesses greatly magnify the chance of exhaustion and hypothermia. Ocean swimming conditions significantly vary from those of a pool. Safety in a pool is no further than half a pool width away and it is always easy to rest. In open water, do not hesitate to seek help if you feel tired, cold or disorientated. Stay close to the marked buoys and connecting line if you are not a strong swimmer. 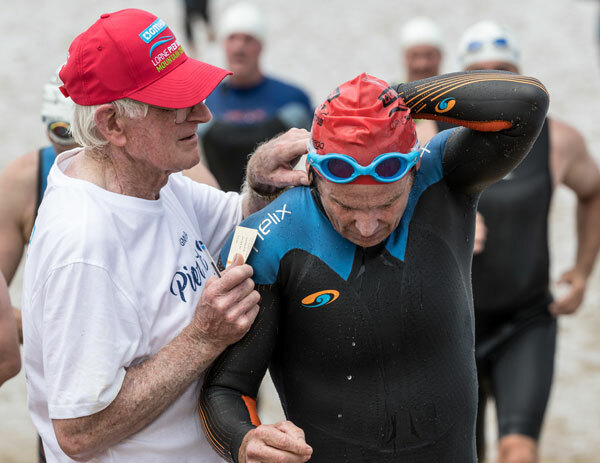 If you are in doubt as to whether or not you should swim, either see your local GP prior to coming to Lorne or one of our medical team at the club, who will advise you prior to the swim. These notes are suggestions from our medical backup team to help increase your safety and allow you greater enjoyment in your swim this year.